H.R. 538, the Native American Energy Act, introduced by Rep. Don Young (AK), addresses the federal government’s overregulation of Indian lands to promote energy development by Indian tribes and Alaska Native Corporations. This bill streamlines and standardizes duplicative federal processes for Indian energy development and empowers the tribes to develop more of their own natural resources. This bill has widespread support from Indian tribes including the Southern Ute Indian Tribe, the Confederated Tribes of the Colville Reservation, and the National Congress of American Indians. This piece of legislation also has strong support from the business community including the U.S. Chamber of Commerce. The only groups on record that oppose this bill are the Obama Administration and several Democratic Members of the Natural Resources Committee. Before a tribe enters a lease with an energy company, it is required by federal law to gain approval from the Department of Interior to validate the lease. This approval process brings numerous levels of bureaucratic review from multiple agencies, which triggers the National Environmental Policy Act (NEPA), increases the potential for litigation, and prolongs the permitting process. These federal regulations place significant financial burdens on tribes and individual Indian landowners, inhibiting them from fully realizing the huge economic potential of developing their natural resources. H.R. 538 removes many of these barriers to energy development that many private and state landowners do not encounter in the development of their lands. 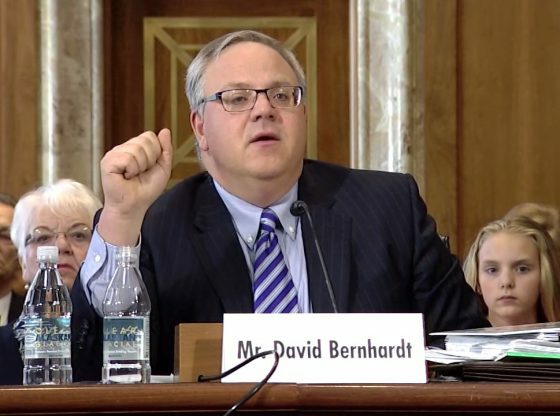 The Obama Administration is choosing to interpret lands held in trust for Indians as federal lands, subjecting them to the Bureau of Land Management’s (BLM) rule to regulate hydraulic fracturing on federal lands. While the land is held in trust by the federal government, the resources exclusively belong to Indian tribes or individual Indians, not the public. This rule will add another unjust bureaucratic burden to Indian energy development, reduce the competitiveness of Indian tribes in energy markets, and increase the cost of doing business with Indian nations. H.R. 538 rightly considers land held in trust by the federal government to be for the benefit of tribes and individual Indians and thus such lands shall not be subject to the Obama Administration’s fracking rule without the consent of the tribal and individual Indian owners. According to a June 2015 GAO Report (link), “Indian energy resources hold significant potential for development, but remain largely undeveloped.” The report details inherent weaknesses in the competency of the Bureau of Indian Affairs to manage oil and gas resources. This drives industry to acquire leases on non-Indian lands leading to missed development opportunities, lost revenue for Indian tribes, and jeopardized viable projects. The House Natural Resources Committee Report explains, “For purposes of mineral development, the Administration treats Indian trust lands as federal land. But for purposes of the cultivation and commercial sale of marijuana—activities prohibited by federal criminal law—the Obama Administration has determined to use its discretion to enforce such laws on Indian lands on the grounds that such lands are uniquely under the sovereign control of their tribal owners.” There is a clear double standard in the Obama Administration’s view of Indian lands as “sovereign” for marijuana production, yet not “sovereign” for energy development.